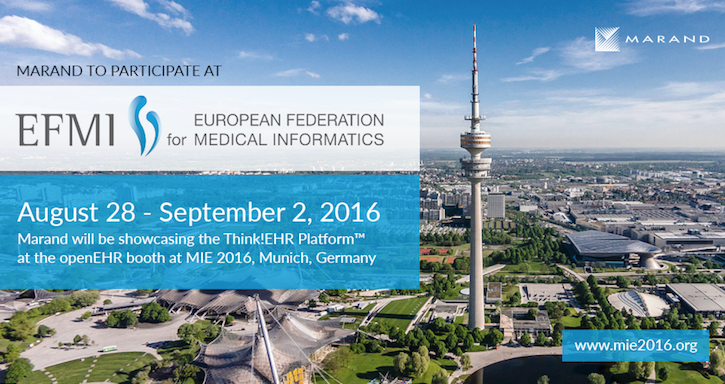 MIE 2016 - Medical Informatics Europe conference, as part of HEC 2016, is one of the key scientific forums for the exchange of new ideas and applications to strengthen healthcare on a national and international level. Marand will be showcasing the Better Platform™ at the openEHR booth at MIE 2016, Munich, Germany, from August 28 - September 2, 2016. Better by Marand’s vision for healthcare IT is coined as "Integrate. Open. Innovate.” Better Platform™ is well aligned with this vision as it uses IHE based standards to Integrate existing devices, systems and data. By storing data in an Open, vendor neutral format it enables ecosystems of vendors to Innovate. This approach is fuelling next generation solutions known as the Postmodern EHR. Better is a Slovenian based company with references including Slovenia’s and Moscow City’s eHealth backbone as well as solutions based on Better Platform™ which are being used in Brazil, Poland, Norway, Sweden and the United Kingdom. One such solution is OPENeP - a comprehensive, user-friendly and innovative medication management system built on Better Platform™. It was developed in close collaboration with University Children’s Hospital Slovenia and NHS England with a vision to completely replace time-consuming and error prone manual paper based prescribing and medication administration processes.